Clear, down-to-earth explanations of pertinent FARs—Parts 61 and 91, NTSB 830, BasicMed. Pros: Clearly written in a manner that makes the topics fun to read. The chapters on each topic are not so large that it overwhelms the reader with information...just enough to explain each topic. Review: I already have my private pilot rating and was looking for a book that summarizes the flight topics in an organized structure. The book uses a cartoon style presentation with pictures that clearly presents the information in a way that makes all the topics fun to read and understand. Now that I have this book, I may get the CD to use in the car on my daily commute. For the price of this book, well worth it. I've been out of flying for a number of years now and this book is a quick read to bring me back up to speed again. Enjoy the book! Review: This is a great book. Made learning about flying easy. Highly recommended. Review: The book was a gift to an aspiring pilot. Pros: Great for a Student Pilot to help with Ground School. Review: I am using this book to supplement my computer based ground school. I'm finding that I am retaining more of what I learn much easier than I did before. Rod's humor may be a bit cornball at times, but I find it helps greatly to make the subjects he is covering easier to remember. Pros: The cover was pretty. Review: Hated it. It was painful trying to sift through and keep the jokes and useful data separate. I ended up trying to read with a black sharpie in hand, crossing out the dribble. After two chapters of this, I had marked out a clear third of the text. Don't waste your time. I felt like I was being held hostage by a frustrated (and not funny) stand up wannabe/infomercial host. 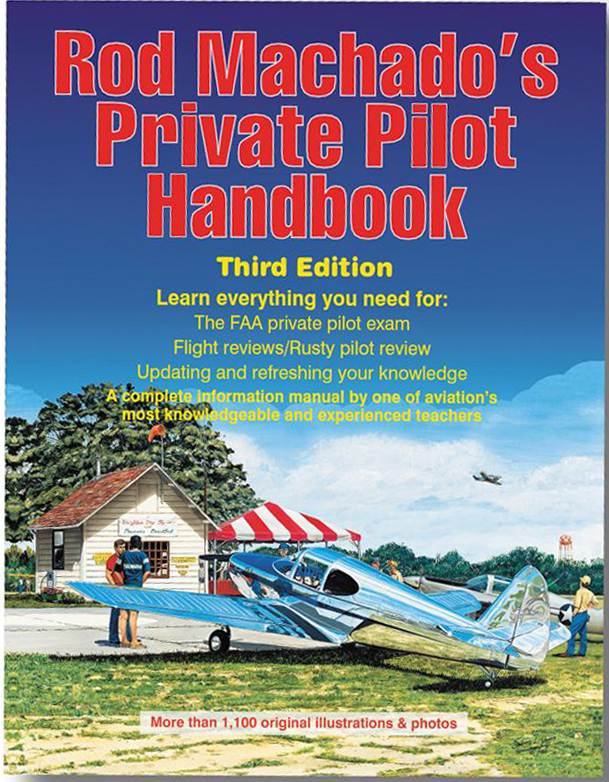 Review: I started flight training with this book. Very good place to start. Review: I simply hated this book. Where I expected a professional but human approach to teaching the subject, what I found was piles and piles of senseless and unnecessary jokes that derailed my thought process while I tried to focus. Perhaps the real information is there, and I tried. I went so far as to take a Sharpie and "line out" all of the paragraphs of silliness and dribble. I lined out a full third of the text. This might be a good book for people who love watching Oprah, but for a serious student, I would advise looking elsewhere for a more professional and intelligent approach. Cons: Honestly don't have any negative comments about the book. It explains the flight topics clearly and I enjoy reading it. Cons: You may not like his style of humor. Cons: Just too frustrating. I wanted to learn about flying. Q: Does Ron Machado have a book for instrument pilots? A: Yes, he offers the Rod Machado's Instrument Pilot's Handbook and Rod Machado's Instrument Pilot's Survival Manual. Q: Does Rod Machado have a book for Commercial Pilot? A: This new edition is a hardcover.